About a year and a half ago, we brought you the story of Vada Murray, former Michigan football stud, Michigan grad, father, and Ann Arbor police officer. He was diagnosed with advanced-stage lung cancer in 2008. He fought the tough fight, inspiring many others to do the same. 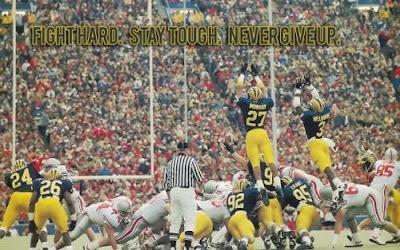 Vada Murray, a former Ann Arbor police officer who played football at Michigan, died today after a long battle with advanced-stage lung cancer. Murray’s battle with lung cancer was first chronicled by the Ann Arbor News in 2008. He was diagnosed at age 41 despite never smoking. His parents never smoked, either. Murray joined the Ann Arbor Police Department shortly after his playing days as a free safety at Michigan (1988-90) were complete. Murray is survived by his wife, Sarah, and their three children. Sarah Murray maintained a website with updates on Vada that has received more than 45,000 visits. Our hearts go out to the Murray family. Fight hard. Stay Tough. Never give up.